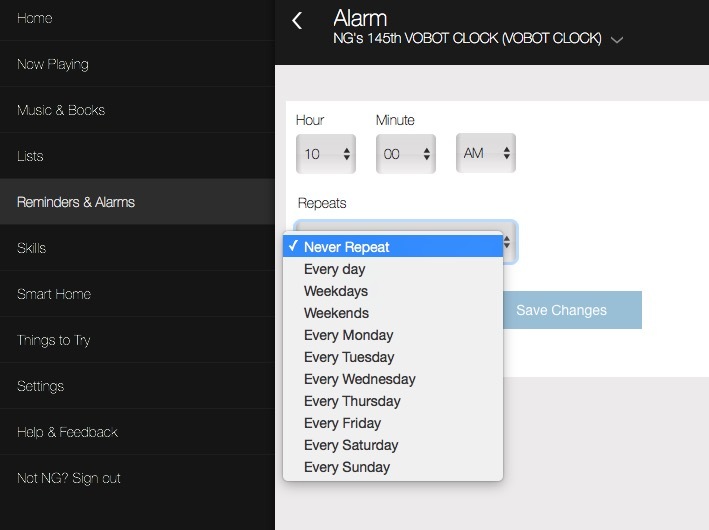 FAQ | How to set a recurring alarm? How to set a recurring alarm? To set any alarm with the Vobot, you will have to use a voice command: "set an alarm for [day of week] at [time]", just specify how often, such as every day, weekdays, weekends or once per week on a given day. Alexa will then confirm that you've set up the alarm and let you know when it's scheduled to repeat. After you've created a new alarm with your voice, you can edit it in the Alexa app. To find more things you can say to Alexa when you’re using alarms, go to Set up or cancel timers & alarms. Select Timers & Alarms from the Menu. Choose your device from the drop-down menu.